A wedding portrait for my friends, Simon and BJ. 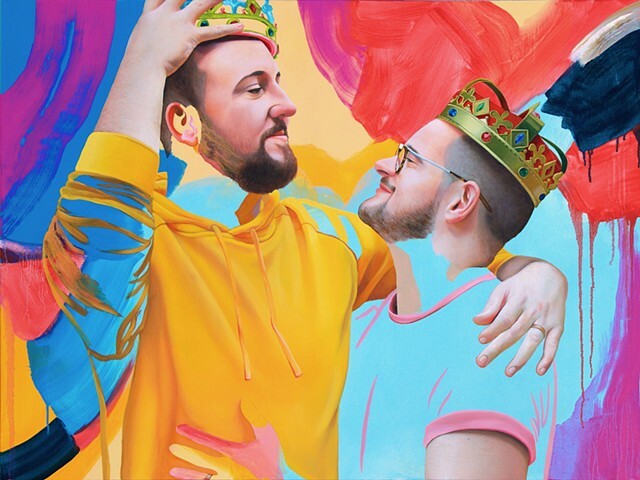 This is my first time painting a cis-male couple. These gorgeous boys just got married and they couldn’t be more fun to be around. Our initial sitting was at their home and involved rainbow capes, high heels, wine and dancing. They gave me complete creative freedom over the three week completion of the piece, and they are willing to loan it for exhibitions. Talk about a dream commission! If you are interested in commissioning a similar work please email Kim directly.